After releasing around fifty 45 rpm singles and his first 33 rpm album (Ethiopian Modern Instrumental Hits AELP 10, re-released by Heavenly Sweetness HL092VL), Amha Esthèté set about compiling his best 45s on a series of now legendary albums (the originals are impossible to find) in 1972. 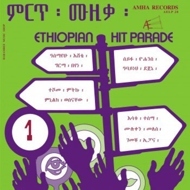 The first four volumes of "Ethiopian Hit Parade" were released in September and October 1972, with the fifth volume appearing in January 1973. You might be the proud owner of Volume 1.